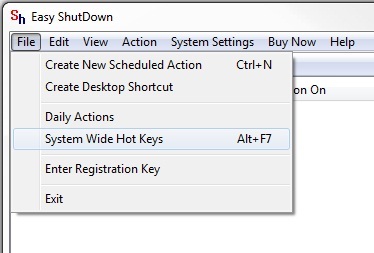 Auto Shut Down your Computer by Configuring System Wide Hot Keys i.e the System Wide Hot Keys Configured for Shut Down Computer will work even when you are working on other application, just in Single Key press the Computer will Shut Down Automatically. To Shut Down Computer with System Wide Hot Key first you have to Download Easy Shut Down Software and Install it on your Computer. Easy Shut Down Software Utility to Configure Hot Key to Shut Down Computer works on Windows XP, Windows 7 and Windows Vista. You can use this Easy Shut Down Utility to Shut Down your Computer with Hot Key on Computer as well as Laptops. Launch the Easy Shut Down application from the Desktop Shortcut. Go to File in easy Shut Down application and Select System Wide hot Keys. Another Window will appear named System Wide Hot Key. 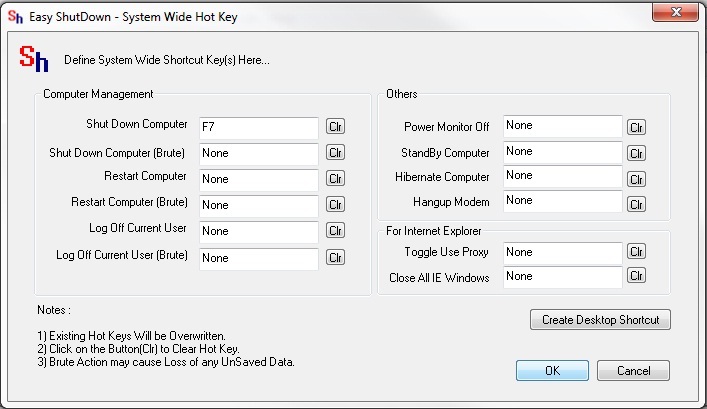 Enter the Hot Key in front of Shut Down Computer box in the System Wide Hot Key Window as displayed in the above Screen Shot. After Configuring the Hot Key for Shut Down Computer press OK.
Now you can press the Hot Key Configured and Shut Down your Computer easily and Automatically with Hot Key. You can Clear the Hot Key assigned to Shut Down Computer easily by Clicking on Clr in front of the Shut Down Computer option. After pressing the Hot Key a dialog box will appear that Computer will Shut Down in 15 secs you can press do it now to do it instantly without waiting for 15 secs or you can also Cancel it.